Next week I'll be kicking off my 3-week series of Oscar cocktails, consisting of nine drinks inspired by this year's nominees for the Academy Award for Best Picture, plus a bonus 10th cocktail for a film nominated in several other categories. I had a lot of fun coming up with drinks last year and couldn't resist an encore. 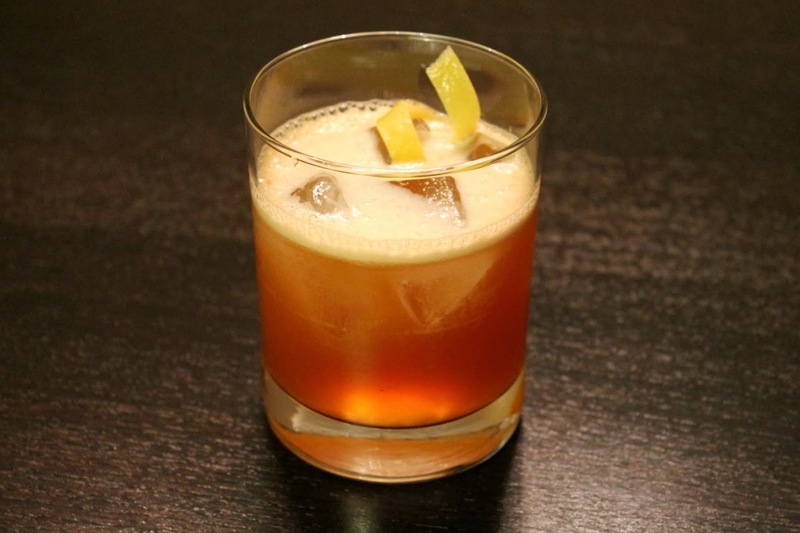 As a preview, here's a cocktail I created to honor Saving Mr. Banks, which was sadly overlooked in the Best Picture category (it was also overlooked in Best Actress--Emma Thompson was robbed! ), but since I had already come up with the drink, I wanted to share it anyway. In the film, Mr. Disney (Tom Hanks) loves his Scotch (he drinks a Scotch Mist, which is just Scotch on the rocks with a lemon twist), and Mrs. Travers (Emma Thompson) loves her tea. Eventually, Travers adds a little Scotch to her tea as well, possibly symbolizing that these two opposing forces may (finally) find some common ground over the adaptation of her novel Mary Poppins into a film. I added the pear liqueur as a nod to the importance of pears in Travers' back-story, as well as the bitters to represent her temperament throughout most of the story. The final essential touch is a spoonful of sugar to make it go down all the better. Combine Scotch, tea, pear liqueur, lemon juice, bitters and sugar in a cocktail shaker with ice. Shake until very cold. Strain into a rocks glass with ice. Garnish with lemon twist. I don't think this film was Best Picture material, but I sure like the drink it inspired. Nice job!